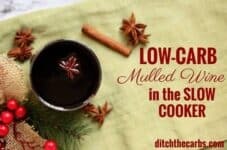 Slow Cooker Low-Carb Mulled Wine - my secret CHEAT recipe! 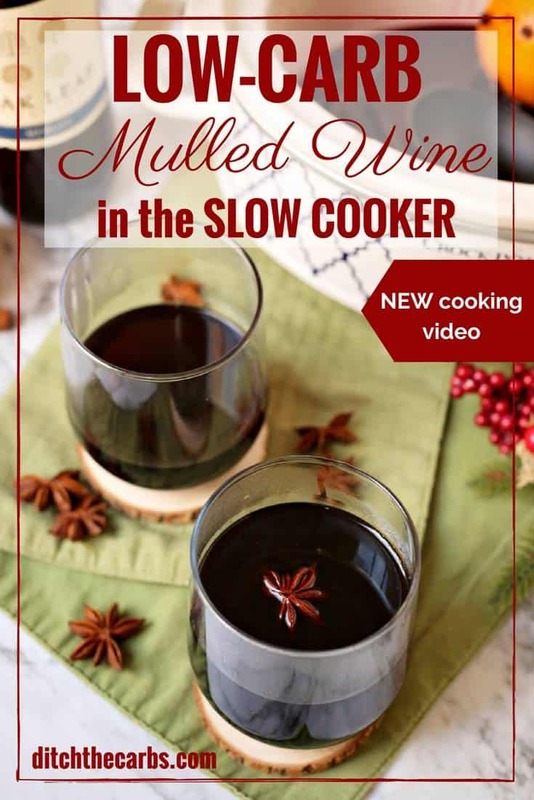 I’m letting you in on my easy CHEAT’S recipe for slow cooker low-carb mulled wine – just promise me this, you won’t tell everyone our secret – it’s the perfect lazy way to entertain guests this festive season. Scroll down to watch the quick cooking video, and make some next time you have guests visiting for the festive season. 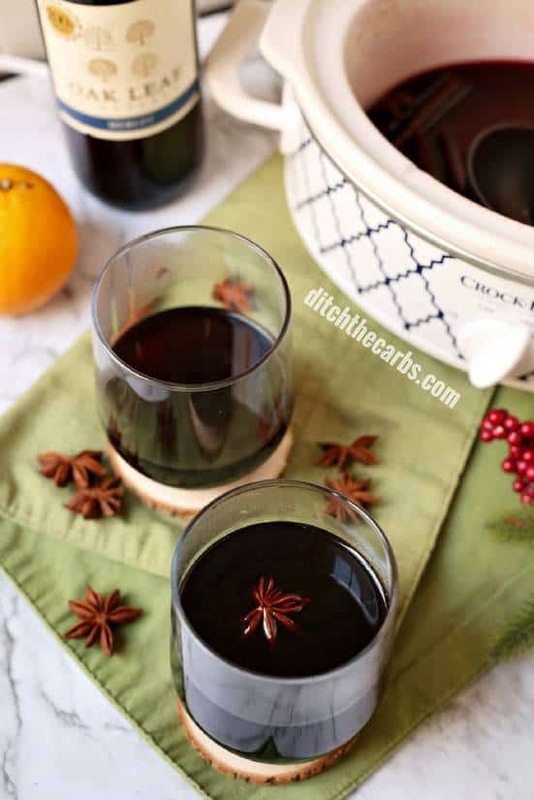 Dreaming of slow cooker low-carb mulled wine? Well here it is. Even though I celebrate Christmas each year mid summer, here in New Zealand, I still love a glass of mulled wine. By preparing low-carb mulled win in the slow cooker (crock pot), it keeps infusing the flavour throughout the wine for the entire party. 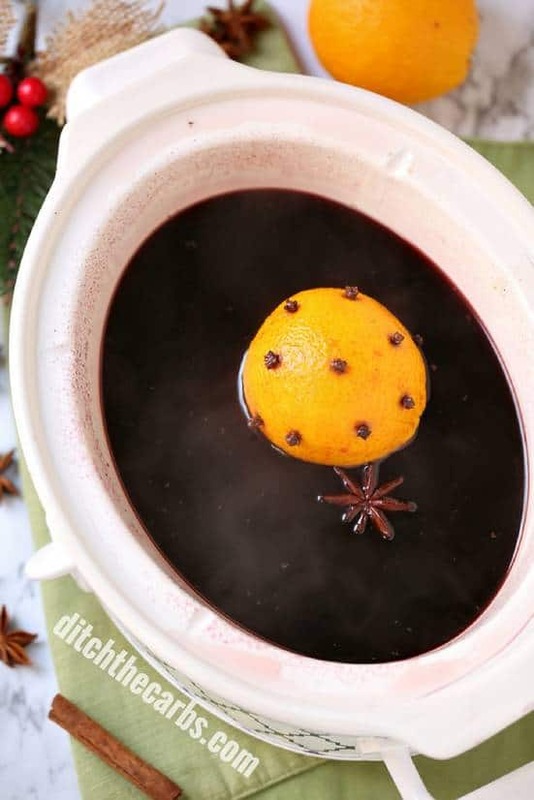 Look at this easy CHEAT'S recipe for slow cooker low-carb mulled wine!! Don't tell everyone our secret - the perfect lazy way to entertain guests this festive season. And no more heating up saucepan after saucepan of mulled wine when it runs dry. 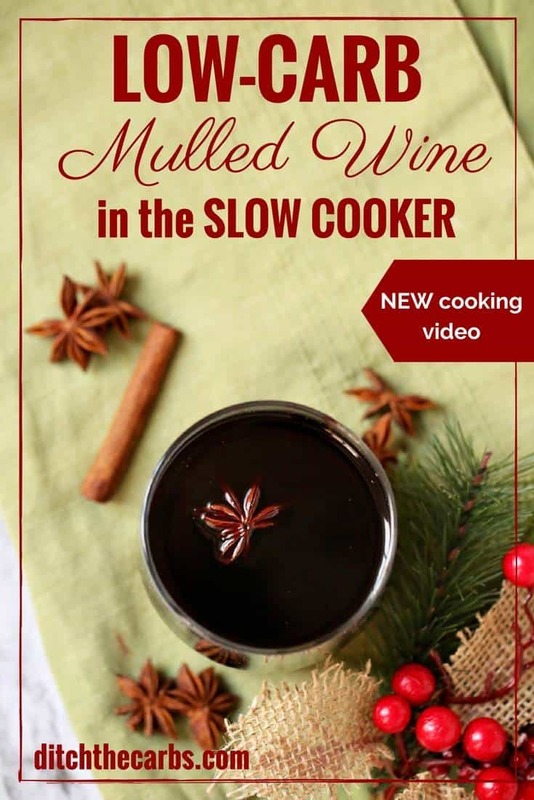 Simply warm through the slow cooker low-carb mulled wine on LOW for 1 hour to allow the flavours to infuse the wine, then keep it on the WARM setting for the remainder of the party. You can even top it up with more wine as the night progresses. You may just need to add a lttiel more sweetener (if desired). Add 1 bottle of red wine into the slow cooker. 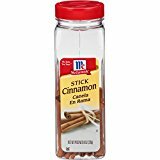 Press whole cloves into an orange, cinnamon sticks, spices, sweetener (optional), brandy and star anise. Heat through on LOW setting for 1 hour to allow the flavours to infuse throughout the mulled wine. Everyone at the party can serve themselves from the slow cooker. Slow cooker low-carb mulled wine will remain warm throughout the evening. The great thing about making slow cooker low-carb mulled wine, is that if you make a huge batch for a party, it stays warm throughout the night, you can top it up quickly, and everyone can help themselves. I make this every year even though it’s a summer xmas here. Using the slow cooker (crockpot) for making and serving low-carb mulled wine, is a stroke of genius. 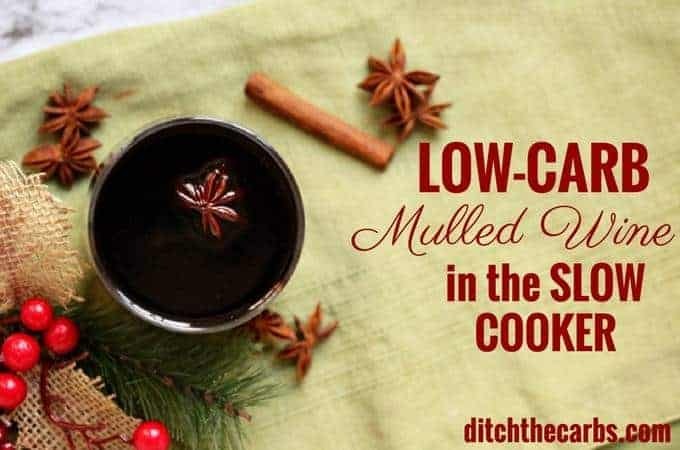 The perfect easy cheats way to serve low-carb mulled wine this festive season. Just don't tell everyone our secret. This is perfect for topping up as the evening progresses. Pour 1 bottle of red wine into the slow cooker. Take the whole orange and push 10 cloves (or more) into the skin. Place the orange in the slow cooker with the cinnamon sticks, star anise, nutmeg and brandy. Stir through and add sweetener to taste (optional). Only add a small amount at a time. 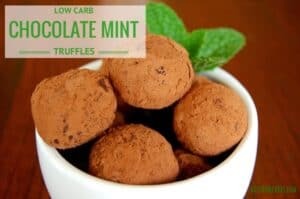 You can always add more if required, but you don't want to risk making it too sweet, or if using stevia, too bitter. No one wants a wasted bottle of wine. Turn your slow cooker on to LOW and warm through for 1 hour, stirring occasionally so all the spices infuse. 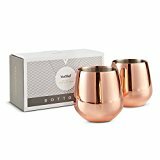 Turn the slow Coker onto the WARM setting, and serve into glasses, or allow guests to serve themselves. As the evening progresses, you may top up the low-carb mulled wine with extra bottle of red wine. The flavours will still infuse fro the orange, cinnamon and star anise. You may just require some additional sweetener. 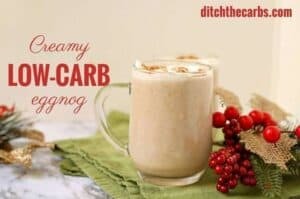 Leave me a comment with your favourite low-carb festive treat. 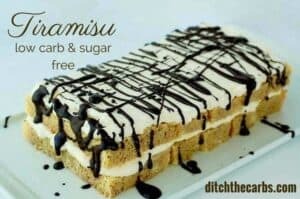 Is there a family drink, cake, dessert or dinner that you have given a low-carb makeover to perhaps? These are mine. Alcohol, as always, is optional. 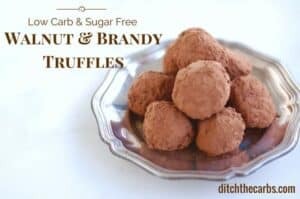 All my recipes can easily be made alcohol free by omitting it entirely. I’m sure this is wonderful, but I was looking to send your sight to my daughter (especially for her kids). While my husband and drink socially, my daughter doesn’t/can’t (due to addiction issues). I wish there was some way to send this without including the wine, as that was her drink of choice—and we definitely don’t want to go back there again. 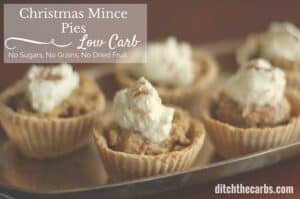 Your Christmas Mince Pies sound wonderful, I do miss mincemeat at Christmas! 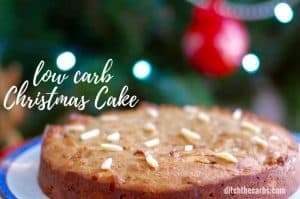 When my husband first went low carb, 5 years ago the first traditional Christmas recipe for us that I tried to make low carb was Lime Madeleines. We had been having them every Christmas for 30 years. The changes were fairly simple and they were a big hit with the whole family. It’s funny how mulled wine seems to work so good, even in the warmer weather. There’s just something slow and mellow about it. It’s perfect when you want to slow down, especially if preparing it doesn’t take much work either.